It’s important to be able to do things on autopilot. Can you imagine having to think through every step to riding a bicycle every time you got on? Or opening your users manual every time you wanted to watch TV? However, sometimes, autopilot can be a problem. We visited our premature daughter at the hospital every day for over 3 months until she was able to come home. Many times after that day, I’d get in the car, and be almost at the hospital before I realised that I should have been going in the opposite direction. And let us consider how we may spur one another on towards love and good deeds, not giving up meeting together, as some are in the habit of doing, but encouraging one another – and all the more as you see the Day approaching. We are encouraged to meet together regularly so as to encourage and spur one another on in our Christian lives. I take this as encouragement to make church a regular and important priority. We are also urged to ‘consider’ how me do this, which I take as call to disengage autopilot. We are to think about why we go to church, what we will do when we are there, who will be there, how we might encourage them, and more. 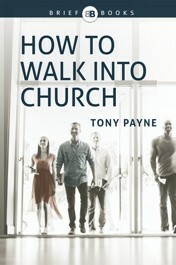 How to Walk into Church contains helpful suggestions for promoting ‘every member’ ministry. You don’t need to be the preacher, the Bible reader, or the song leader to be able to influence others. We can all strike up conversations shaped by the Word of God. We can look out for one another, notice who’s missing, and show hospitality to newcomers. If church has become a passive experience, then this book will help you to turn things back toward active engagement every week. This brief book is one that I plan to use as a tool in our ministry. Our church has already purchased a box of these books and we are promoting them to our regulars. My hope is that the book can also become part of a membership toolkit. When people indicate that they’re keen to belong to our church, then we will talk through how they can contribute to the ministry. We may well give them this book, urging them to read it, jot down some notes and questions, and we’ll talk about it together. I will be recommending this book to churches, small groups, and individuals. There are many strengths of this book, not least is that it’s only 64 pages and takes 30 minutes to read. Yet more importantly is that it is derived clearly from the Scriptures. Some books about ‘what to do in church’ simply springboard from the Bible into the pool of pragmatism. Having read over this book a couple of times, there are improvements that I think could be made in a second edition. It’s a good book that could be even better. I’d like to be able to offer this book to anyone who comes to our church—whether they are Christian or not. Thus, I think the book would benefit by a clearer explanation of how to become part of the heavenly church, the church belonging to Jesus. While this point is made, a few pages completely devoted to the message of the gospel would strengthen its impact. I’d also like to read more practical ideas for ministry at church. Perhaps in between chapters we could read some cameos of people in their service at church. Alternatively, each chapter could finish with some dot points of ideas, or even a section for personal reflection and prayer for the reader to map out some ideas for service. I had an opportunity to raise these suggestions with the author at a recent conference and he was most receptive. I sensed that his desire is to serve the church by listening as well as by writing. Thanks for your review of this book and your words of wisdom on the subject of belonging to a local church. I am convinced of the need for this, and I am committed to my local church. Another good little book that can be handed out to Christians and non-christians alike is The Essential Jesus, published by Matthias Press. It is a modern translation of Luke, and in addition it contains some chapters for non-christians – the background to the story, what you need to do about it, etc. I suspect that it is not impossible that such a notion (though being highly desirable) might, at best, be somewhat dubious and, at worst, be a fallacy. What do you think ? In addition, if we were able to send a FaceBook message to the Apostle Paul asking “Paul, what is the best way to walk into church?” I wonder what his response might be ?